Are you planning a trip abroad and wondering the easiest way to get your passport photos done? Getting photos can be time-consuming as well as confusing to know what options exist. The result is a last-minute scramble for a lot of people. Incorrect passport photos are the number one reason applications are delayed. In 2017, the Department of State rejected a quarter million passport photos! So make sure you get this right. Here we break it down for you: how to get a good passport photo and how you can get one quickly. What are the requirements for my passport photo? Your passport photo needs to be recent, within the last 6 months. It also must be clear, centered and with your face looking at the camera - no shadows, weird angles or silly expressions. Be sure your entire face is visible, from the top of your head down to just below your collarbone. If it’s any closer than that, it won’t be accepted. The photo needs to be 2” x 2” when printed. Remove anything that could obscure your face like glasses and hats, keep your hair out of your face and make sure there are no shadows on you. You need to be in front of a white or off-white background with good lighting. Lastly, no uniforms or headphones or wireless devices. Think clear, centered and unobstructed and you'll be good to go. What are the best places to get quick passport photos? 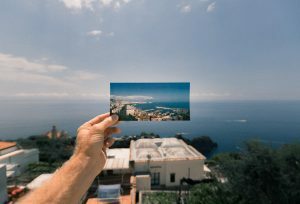 Shipping centers, pharmacies, and US Passport offices are your best bet for quick and affordable photos. FedEx and UPS both offer passport photos, just make sure you choose a location that offers passport and office services. Many are shipping-only. The photos will cost you around $12-$15. Membership places, like Costco and AAA, also offer passport photos and run a bit cheaper than the shipping centers. You just need to be a member. Purchasing a new membership just to get passport photos, though, is probably not worth it unless you’re already thinking about becoming a member. Pharmacies and retail stores, like CVS, RiteAid, and Walgreens, are common and convenient options. With thousands of locations, it’s hard not to find one of these near you. Most can turnaround photos in about 1 hour and will cost around $9-$13. Though high quality, professional photos studios are expensive and unnecessary, so we recommend you save your time and money and chose a different option. If you’re already headed to a passport application acceptance facility, most have a passport photo service, so you can get photos while you're there. Where we don’t recommend you get your photos are photo booths, old photos stored on your computer or cheap, disposable cameras. These will be lower quality than required or too old. What other passport photo options do I have? If you don’t want to deal with the hassle of taking and printing your own photos, going to the bank to get a check, and then waiting in line at the Post Office, there are options that make it easier. For example, YoGov has a door-to door passport concierge service. A passport concierge will take care of everything you need to renew your passport in just a few minutes. This includes meeting you, taking your new passport photos, and collecting your old passport and getting your new passport back to you safely and securely. 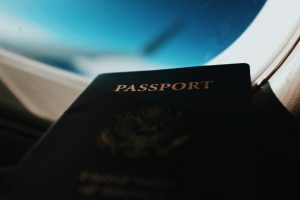 There are also overnight passport options, like RushMyPassport, but typically you still have to print the photos, forms and go to the post office.